Who Were You 1000 Years Ago? Answer These 7 Questions To Find Out! Are others often able to convince you to do things you wouldn't do otherwise? Visions and super-natural beings tend to be able to convince me to do things, yes. Do other people consider you "greedy"? Do you sometimes get the urge to leave home and travel far away? Wherever I go I make it my new home. Do you find you are often satisfied with what you have? Or are you always wanting more? Everything in this world is already mine. Do you enjoy sports or large gatherings more or less than other people you know? Does war count as a sport or large gathering? Do you often regret the decisions you made in the past? I often lose sleep over guilt from things I've done. What is the most likely item someone would find in your home? A dress with a spot on it. You might have been Leif Erikson! The son of Erik the Red you were a bold explorer who landed in North America long before other European explorers did. You might even keep some of those artifacts in your home! Your past as a Viking is likely why you get the urge to travel far away from home. It is also likely why you are never satisfied with what you have and are always seeking out more. Based on your answers, it is entirely possible you were MacBeth. Your past as the tragic figure is likely why you feel such regret about your actions. It's also likely why supernatural beings are able to convince you to do things you wouldn't normally do, like kill Duncan. In general, you are a good but easily corruptible person. It is also possibly the case that your partner has a difficult time getting stains out of dresses. "Out damn spot!" 1000 years ago the leader of Rome was Basil II. Based on your answers, we believe its possible you were them in a former life. The Roman Empire experienced a bit of return-to-glory period 1000 years ago which might explain why you don't like to take too many chances. In general, people don't consider you greedy but rather you are satisfied with what you have. The Roman Coliseum's role in your past is likely why you enjoy sporting events or other large gatherings. Your society's emphasis on putting rulers' faces on coinage is perhaps what has led to you keeping a coin collection in your home as well. You might have been Genghis Khan! Your confidence and bold approach to life is likely due to your success as Genghis Khan in a previous life. While you were a little violent back then, you also helped bring together large societies and establish advanced trade networks. You were far more successful than your father in your endeavors. Your lust for expansion in a previous life is likely what fuels your current approach to wanting more today. Maybe try and be a bit more happy with what you have instead of always wanting more! 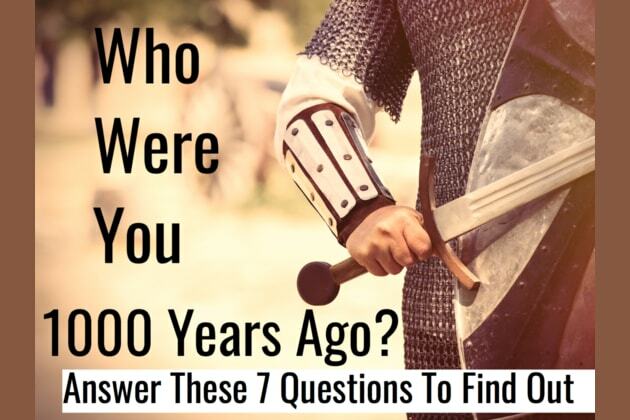 Based on your answers, you might have been William the Conqueror. This Viking attacked England and took it for his own, ruling the land for 20 years until his death. Your attitude today is colored by your past as the Viking King. People say you are greedy, you take things you want, and you are never satisfied with what you have. Also, if people enter your home, they are likely to come across many of the stolen items you keep there. The world was a much different place 1000 years ago. Life expectancy was shorter, Vikings kept stealing people's things, and wifi signals were quite poor. Those who believe in reincarnation say we've all lived many lives throughout existence. Your personality traits will help us determine who you were 1000 years ago. Take the test and learn about how you helped to shape this world in a previous life.